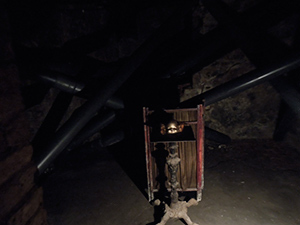 The work of three artists, Helen Mayer, John Howard and Nicholette Goff, examines particular aspects of memory - exploring themes of recollection, reminiscence and remembrance; memory in a submerged or suppressed state; the re-construction of memory; appropriated and buried memory; and the destruction of recurring 'guilt'. 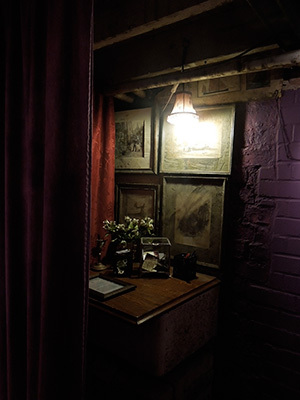 The exhibition was installed in a large cellar below the True Briton, a harbourside inn in Folkestone, for the duration of the Folkestone Triennial (30 August- 2 November). "My proposal is to fabricate a room that is loosely based on a traditional church Confessional. But, having neither pretence to offering absolution nor any leaning towards a particular religion, my secular confessional is purely a space in which people might reflect on the nature of 'unresolved guilty secrets'. The type that gnaw away inside and pop up unexpectedly, causing distress. My intention for the piece is that people see how memory is an unreliable process. It is notoriously fickle, frequently misconstrues events, and leads us to believe we have caused more harm or bad feeling than we actually have. Things that are quite trivial are dissected and re-shaped by false memory, then popped back into our minds to haunt us when we least want it. Sometimes throughout our lives. My confessional invites people to take part in an act of open disclosure of their secret regrets, a 'calling out' of sabotaging voices, and a 'pointing finger' to their enfeeblement and dissipation."